Clayton Thorson fires a pass. The junior quarterback turned the ball over three times against Penn State. Clayton Thorson has always had the tools. The junior quarterback is a big guy with a rocket arm, and he’s not afraid to face the media after a loss. Combine that with his status as a highly touted recruit when he signed with Northwestern, and it’s easy to believe Thorson is good enough to take the Wildcats wherever they want to go. But following a pitiful offensive showing by Thorson and NU in last Saturday’s 31-7 loss to Penn State, the time is right to separate perceptions from performance. And though it pains me to use such a cliche, it might be time to admit that Thorson simply doesn’t have the “it” factor that sets apart great quarterbacks from the rest. Everybody defines “it” in their own way. Mine is a simple test: When all else goes wrong on offense, can the quarterback elevate his play to carry his team across the line? It’s a particularly salient question for this Cats team, with major issues up and down the offense. To turn the season around, NU may well need those kinds of heroics from Thorson. This season, Thorson hasn’t shown that ability. In NU’s three losses, he hasn’t been able to overcome the tough situations in which he’s found himself. His anticipation and field vision have been suspect, and he hasn’t shown much proclivity for evading pressure and keeping the offense moving when games are on the line. He’s taking sacks at a higher rate than last season, and he’s thrown seven picks after tossing nine in all of 2016. Racking up stats against overmatched opponents like Nevada and Bowling Green doesn’t erase the flaws Thorson has shown the rest of the year. Thorson is a mirror. Given a good day by the offensive line, an effective rushing attack, separation from his receivers and a smart game plan, Thorson can make the plays to win games. Without those things, he’s liable to make as many back-breaking mistakes as good throws. Only a small group of quarterbacks can single-handedly carry their teams. Thorson is good enough to win games when the Cats outplay their opponents in other ways, and that’s not bad for a guy who barely completed half his passes as a redshirt freshman. But Thorson’s tools and pedigree have always had NU fans seeing a player that wasn’t really there. That’s how a guy who was 98th in the country in yards per pass attempt last season came into the year with serious NFL draft buzz. Throw out the hype and something has always been missing from Thorson’s game — the ability to rise above his surroundings, take over and turn losses into unlikely wins. 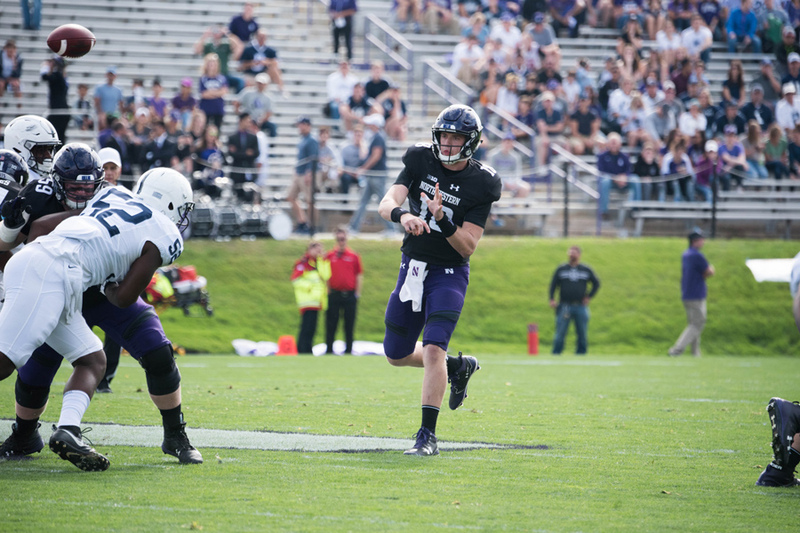 Now in his third season as a starter (and fourth in the program, counting his redshirt year), the Cats’ signal-caller will probably not find “it” before he leaves Evanston. At this point, he is who he is. For an NU offense suddenly facing so many question marks, that might not be good enough.